Students from Waterford, Cork and Dublin joined Trinity students before joining the thousands taking part in today's march. 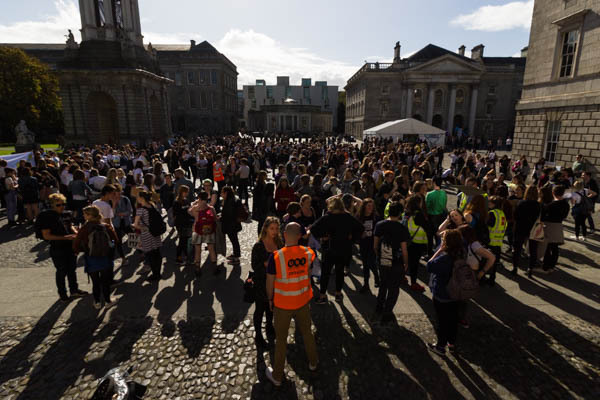 As momentum grows towards a referendum on the eighth amendment, close to 1,000 students gathered in Front Square before joining the March for Choice. To chants, cheers and speeches, in what organisers are hoping will be the biggest march of the campaign so far, hundreds of students flooded Front Square this afternoon. Students’ unions from across the country travelled to Dublin including delegations from NUI Galway Students’ Union (NUIGSU), Waterford Institute of Technology Students’ Union (WITSU) and Dublin City University Students’ Union (DCUSU). 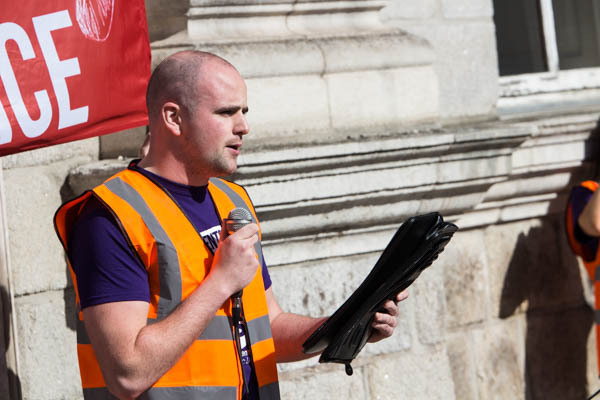 Addressing the crowd before the march, Trinity College Dublin Students’ Union (TCDSU) President Kevin Keane said that the size of the crowd present was a “statement that the students of Ireland will not stand idly by as our rights are abused”. Referring to the history of students involvement in the movement, Keane warned that “the next seven months are going to be long, and sometimes very very hard”. Speaking to The University Times before the march Síona Cahill, Vice-President for Equality and Citizenship in the Union of Students in Ireland (USI), said that the interest they’ve seen in the issue has “grown exponentially” in the last few months. Cahill said that USI are hoping for a larger turnout due to more unions across the country securing mandates to support repealing the eighth amendment. Mike Kerrigan, President of USI said, told The University Times that the union was expecting nearly 1,000 students to attend the march today. Time and resources have been split between today’s march and the next week’s March for Education, Kerrigan said, but he didn’t think turnout had suffered. “We have nearly every students’ union from the country here. It’s something we’ve been campaigning on for nearly three decades. We’re hopefully at the final few hurdles”, Kerrigan said. A delegation from Queen’s University Belfast Students’ Union in Northern Ireland will also be attending the March for Choice. A referendum date looms over today’s march. Taoiseach Leo Varadkar has committed to a referendum in May or June of next year, though any potential wording for a vote is still yet to be decided. Many groups marching today have called for a full liberalisation of abortion, as recommended by the Citizens’ Assembly. Students marching today will join thousands of people marching under banners, organisations and groups that, in only a few months time, will be forming the core campaign calling for a repeal of the eighth amendment. Many unions reported a higher turnout this year for the march. Dublin Institute of Technology Students’ Union (DITSU) reported a turnout of over 70 students, with DCUSU and University College Cork Students’ Union (UCCSU) reporting a similar turnout. President of USI Michael Kerrigan speaks to students in Front Square. UCD for Choice, who were formally invited to attend the march by USI, were also present. Speaking to The University Times Auditor of UCD for Choice, Aoife Grey, said that the turnout from the university today “shows a great resilience to what we believe in especially with the whole SU drama”. “I think it shows that no matter who is in power, we will fight for what we believe in”, she continued. Last year, over 1,000 people marched with over 300 students gathering in Front Square. In recent years, the number of people joining the annual demonstration has swelled, as students have become a central part of the national campaign against the eighth amendment. TCDSU first participated in the march as a group in 2015, after a referendum in 2014 saw 73 per cent of the student population voting for the union to support the repeal campaign. In March of this year, the city centre was brought to a standstill when thousands of people congregated on O’Connell bridge to protest the eighth amendment. Later that day, an estimated 8,000 to 10,000 people marched around city centre in further protest. This march was one of the largest to date of the campaign, with the focal point of the demonstration being the frustration at the lack of the timeline for a referendum. In April, the Citizen’s Assembly voted to recommend that the amendment be replaced or amended, not removed from the constitution. The next day, the group further voted to recommend that women be allowed legal access to abortion in this jurisdiction with no restriction as to reasons. These recommendations were a strong vindication of the aims of the pro-choice movement over the last number of years. Niamh Egleston, John Conway, Aisling Marren, Grace D’Arcy and Eleanor O’Mahony contributed reporting to this piece.